I dont know about you guys and girls, but I had a fantastic long weekend of fishing. It ended yesterday with a fantastic session on my friends boat. We ended up catching loads of Pollock around Portland Harbour on lures. I also seen a few Mackerel and had my lure attacked by a couple of large Garfish. I managed to make time to do a couple of days filming, so once I get round to editing it, I will have a couple of interesting videos for you to watch. We didn’t have very many entries for last months fish of the month, but this month could be very different. I have a couple of entries in already. Cameron Lomen struck it lucky. 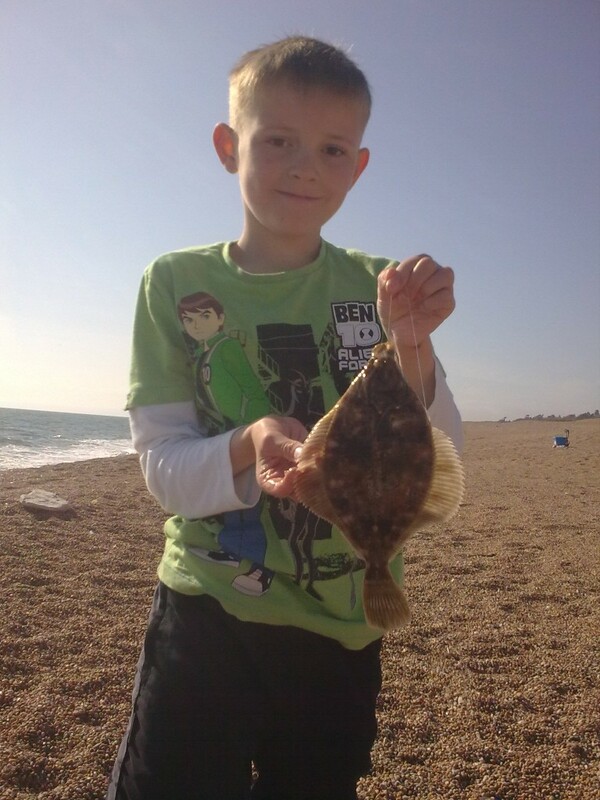 On his first ever cast sea fishing at West Bexington, the youngster managed to land a nice Flounder. 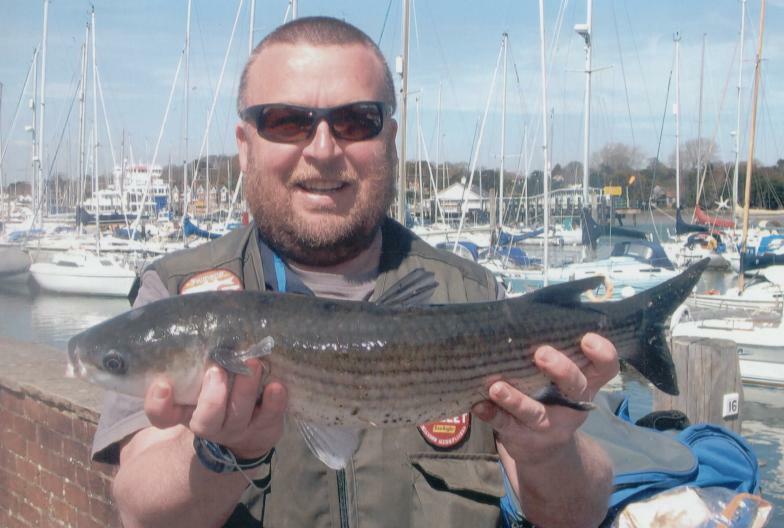 Steve Gannon took a trip over to Lymington for an early Thick Lipped Mullet session and managed to land a lovely 4lb 2oz specimen on bread. Steve who normally fishes Weymouth for the Mullet, decided that he couldn’t wait for them to arrive in Weymouth. It looks like the trip paid off for you Steve. Chesil Beach: Calm . The water has a milky tinge to it. Portland: Calm with almost clear water. Weymouth Bay: Calm with a slight tinge to the water. Chesil Beach forecast: Pretty much the same as yesterday with lovely calm conditions and almost clear water. However make the most of it, as I have had a look at Windguru and it looks like the wind is going to pick up and be pretty strong towards the end of the week. There are more Smoothounds showing now, with some fish around 5lb caught yesterday. The majority of them are still small. Plaice and Dabs are to be expected from West Bexington and Cogden, but as usual most of them are coming at distance. Herring seem to be in larger numbers than the Mackerel at the moment, but that will change soon. It is great to see the Herring shoals get bigger every year. lets hope it keeps improving. Portland: I know that quite a few people fished Portland for Wrasse yesterday and done quite well. I heard of a 6lb Ballan that was landed from Chine. Pollock fishing has improved a lot over the past week, with a lot more fish about at last. May is traditionally one of the better months for big Conger from the rocks. Large Mackerel baits fished at night are the key to success. Portland Harbour: Still nothing much happening in Portland Harbour from the shore. It has to improve soon! Weymouth Bay: Plenty of small fish coming from Stone Pier with the odd decent one amongst them. You should start to see Garfish and Mackerel being caught on light float tackle from now on. I have not heard of anyone fishing Preston end of Weymouth beach, but with small tides you are only likely to pick up a few Flounder.